The weather is getting more and more extreme. On April 23, 2016, temperatures in India were as high as 47.7°C or 117.9°F. At the same time, temperatures in California were as low as -12.6°C or 9.2°F, while temperatures in Greenland were as high as 3.6°C or 38.6°F. Meanwhile, Antarctica was as cold as -60°C or -76°F. The situation in India is most worrying. Temperatures are very high in many locations. India has been experiencing heatwave conditions for some time now, as reported in this and in this earlier posts. 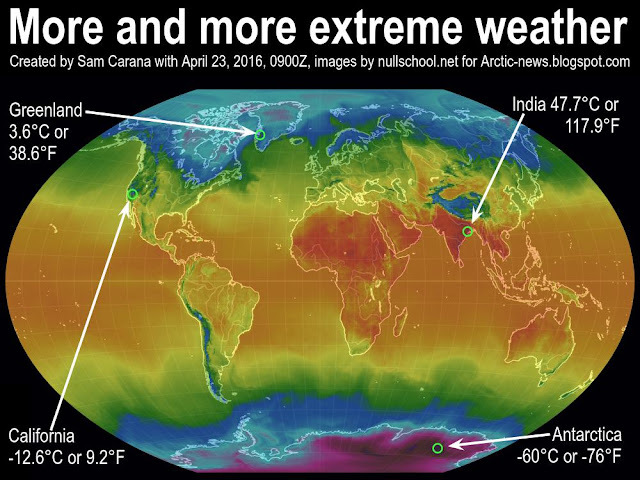 More extreme weather goes hand in hand with changes that are taking place to the jet stream, as also discussed in earlier posts (see further below). As the Arctic warms up more rapidly than the rest of the world, the temperature difference between the Equator and the North Pole decreases, which in turn weakens the speed at which the north polar jet stream circumnavigates the globe. 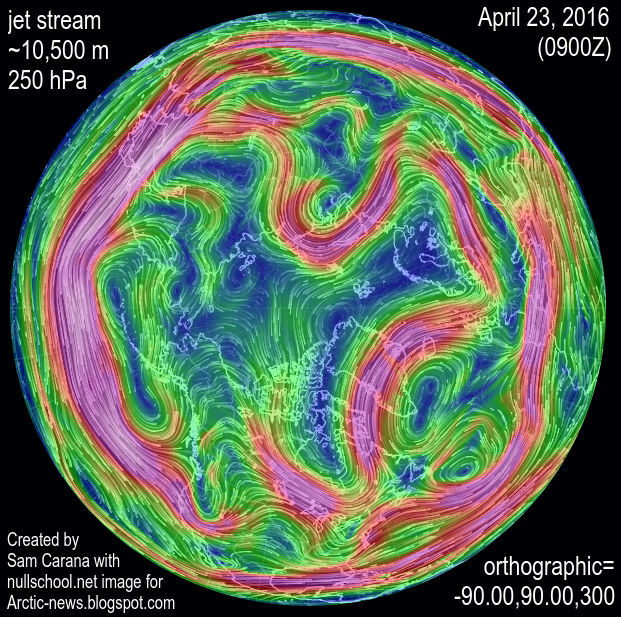 This is illustrated by the wavy patterns of the north polar jet stream in the image on the right. The outlook for the next week shows the north polar jet stream move higher over the arctic, and to eventually disintegrate altogether, while merging with the subtropical jet stream over the Pacific Ocean. The video below shows how a very wavy jet stream is projected to disintegrate over the Arctic Ocean over the coming week. This makes it easier for warm air to move into the Arctic and for cold air to move out of the Arctic, in turn further decreasing the temperature difference between the Equator and the North Pole, in a self-reinforcing feedback loop: "It's like leaving the freezer door open." Temperature forecasts for the Arctic Ocean are high, with anomalies projected to be above 4°C for the Arctic over the coming week. 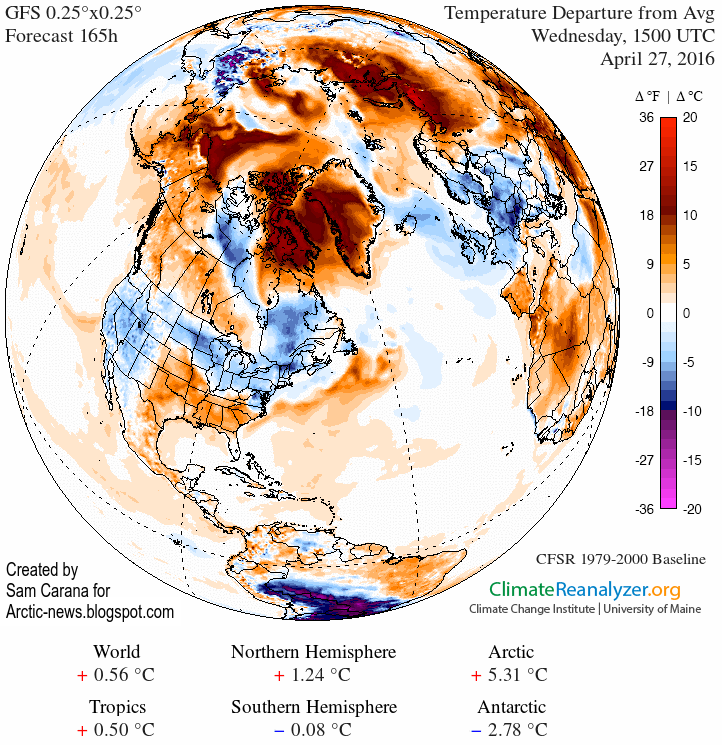 The image on the right shows one such forecast, projecting a temperature anomaly of 5.31°C or 9.56°F for the Arctic on April 27, 2016, 1500 UTC, while an earlier forecast projected a 5.34°C or 9.61°F anomaly (hat tip to Mark Williams). The danger is that the combined impact of high air temperatures and ocean heat will cause rapid demise of Arctic sea ice over the next few months. On April 22, 2016, the sea surface was as much as 11.3°C or 20.3°F warmer than 1981-2011 (at the location off the coast of North America marked by the green circle). 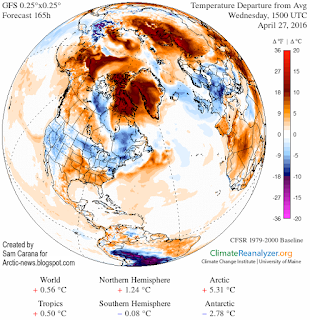 High ocean heat is further accelerating Arctic sea ice demise, as the Gulf Stream keeps carrying ever warmer water into the Arctic Ocean. 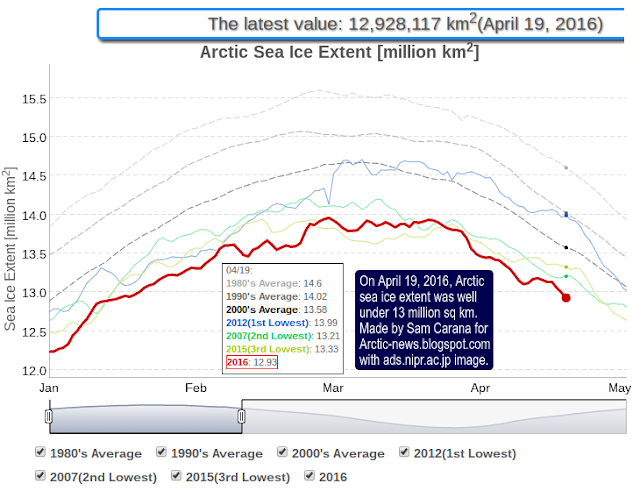 The image below, created with an image from the JAXA site, shows that Arctic sea ice extent was well under 13 million km2 on April 19, 2016, and about 1 million km2 less than the extent in the year 2012 around this time of year. Demise of the sea ice will cause even more rapid warming of the Arctic Ocean, with the danger that more heat will penetrate sediments that contain huge amounts of methane in the form of hydrates and free gas, threatening to trigger huge methane releases and cause runaway warming. 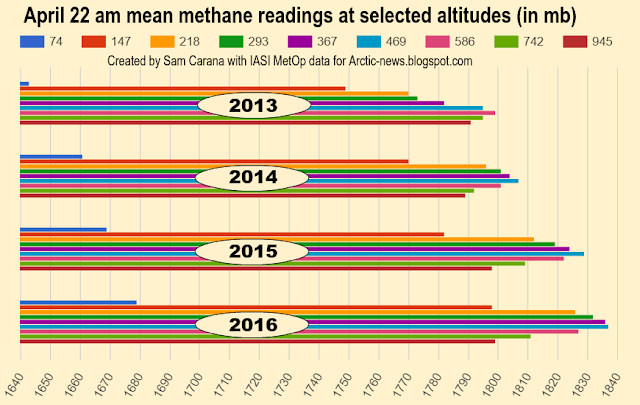 Methane levels are increasing strongly. This may not be as noticeable when taking samples from ground stations, but the rise is dramatic at higher altitudes, as also discussed earlier in this post and in this post. The conversion table below shows the altitude equivalents in feet, m and mb. Sam, the maps of temperature don't mat with the locations of temps cited.. The public tends to throw the baby out with the wash water at small error. The rate of Carbon Dioxide increase of 3.09 last year was largest in 66 m yrs and indicates we will have an event coming soon dwarfing the PETM unless we can somehow sideswipe the direction of the world to tackle it. Hi Sam, in the 1st two figures, the specific extreme temperatures cited don't seem possible given the map's key. Also the surface wind map doesn't show much of a cyclone left North of Madagascar. I think you have cited temperatures accidentally of prior date to April 23, 2016. Still unsure what you mean, Dale. I spotted temperatures as high as 48°C or 118.3°F in India on April 23, 0900Z, click here to check it out. Please see my videos above to realize sea level rise will come much more quickly than expected. Thanks Sam, It does say that, you were right, I haven't gotten local temps to pop up for location. It's rough thinking of all the local peoples' trial at time of Earth's temperature increase.. 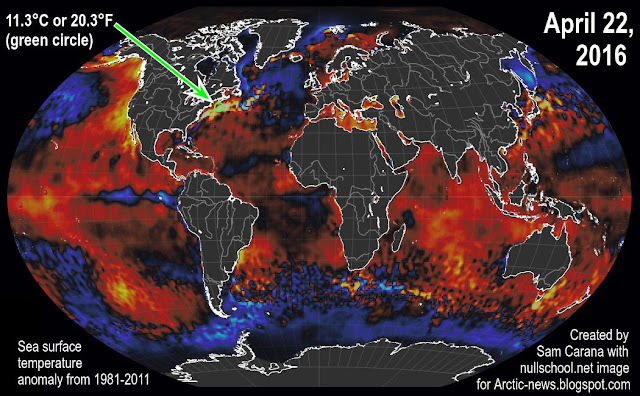 I look at Null School and Climate re-analyzer and try to picture what the world is thinking vs Real.